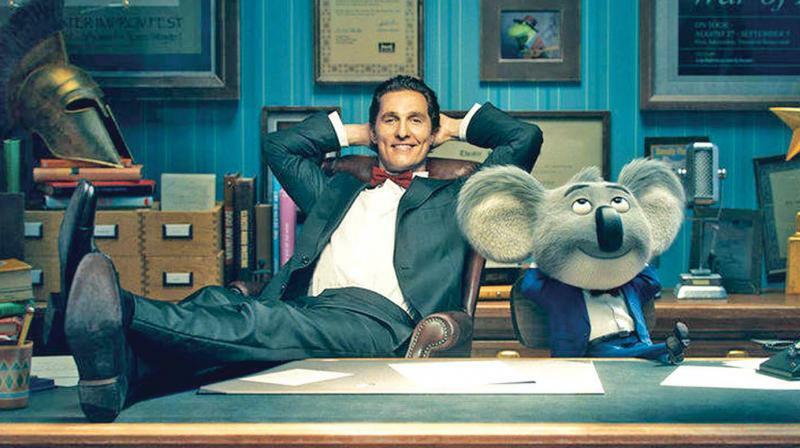 One of the most acclaimed actors in Hollywood and an Academy Award winner, Matthew McConaughey talks about his fears, his character in the movie Sing and reactions of his children towards the movie. One of the actors acknowledged to be the ‘handsomest in Hollywood’ plays a Koala showman in the Indian relevision premiere of Sing on January 28 at 9 PM on Sony PIX. Q In SING you play the main character Buster Moon, who came up with the idea to organise a singing contest. What do you like about him? Q It’s interesting to see those flashbacks of Buster’s early life, when we understand where his passion for the theatre and entertainment takes off. Q The truth is that even though there are many characters in SING each and every one of them have a well flushed-out storyline. There are many storylines - with Buster in the middle - that you can follow and that all come together in SING. And each time you get back to one you think, “Oh, I’m glad I’m back here!” because you had missed that character. Not many films are capable of doing that. Q Did the director of movie SING Garth’s openness allow you to bring your own input to the role of Buster Moon? Yes, because I came in with my own ideas for the character and after our first conversation, which lasted around three hours, we both felt that we were starting off on the right track. I was very receptive to Garth’s ideas, too. There is a real freedom and trust that comes from playing make-believe with animated characters that makes you want to give things a shot. Q The film talks about overcoming our fears. Can you relate to that in any way? Yes, daily! There are two types of fear: the one where your Spiderman senses are going off for a good reason, and then there are the butterflies you have because you are just scared of failing. Q How did SING surprise you when you finally saw it completed? It surprised me to see the different storylines Garth brought to the forefront and how the film gives each one of them a beginning, middle and resolution. But, at the same time, the movie doesn’t feel too busy or confusing. SING is a joy! One of the great things about what we get to do in our business is to entertain. This film is a very interactive experience in the theatre. And even though the humor is there, it doesn’t have a bunch of one-offs. This story is thread together and told really well and that’s a great reason to go to the theatre. Q Does music play an important role in your life? I’ll actually take it over moving pictures! It’s very important to me in getting through my daily life because it allows me to form my own pictures. Sometimes you feel they are singing that song to you or that you are singing it. On other occasions you feel it’s just an ambience anthem that’s coming from nowhere in particular but that fits the moment. I’ll never forget how Richard Linklater, on his first day on the set of Dazed and Confused, handed us all a cassette with 5 songs on side A and another 5 on side B and told us to listen to it because he thought it was the kind of music our characters would be listening to. What great direction!